Ships today if you order in the next 5 hours 14 minutes. 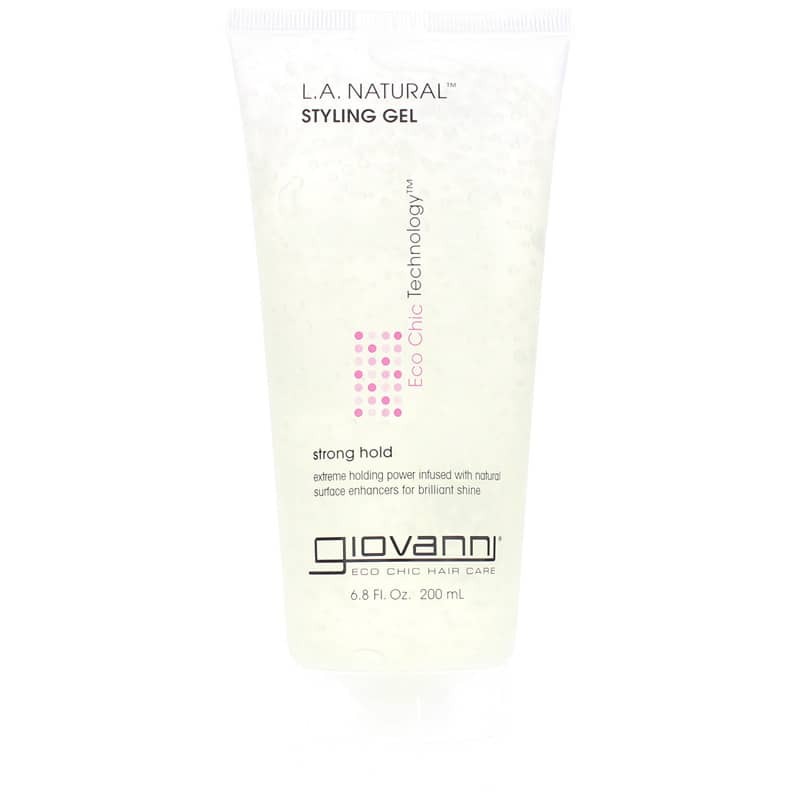 L.A. Natural Styling Gel Strong Hold from Giovanni Organic Hair Care offers extreme holding power infused with organic surface enhancers for brilliant shine! This controlling gel takes hold to the extreme. Its natural base includes extraordinary ingredients that grab onto style and hold on tight. With this strong holding gel, you can stand firm in the spotlight. Infuses each individual strand of hair with vitamins, nutrients and protein for strength and vitality. 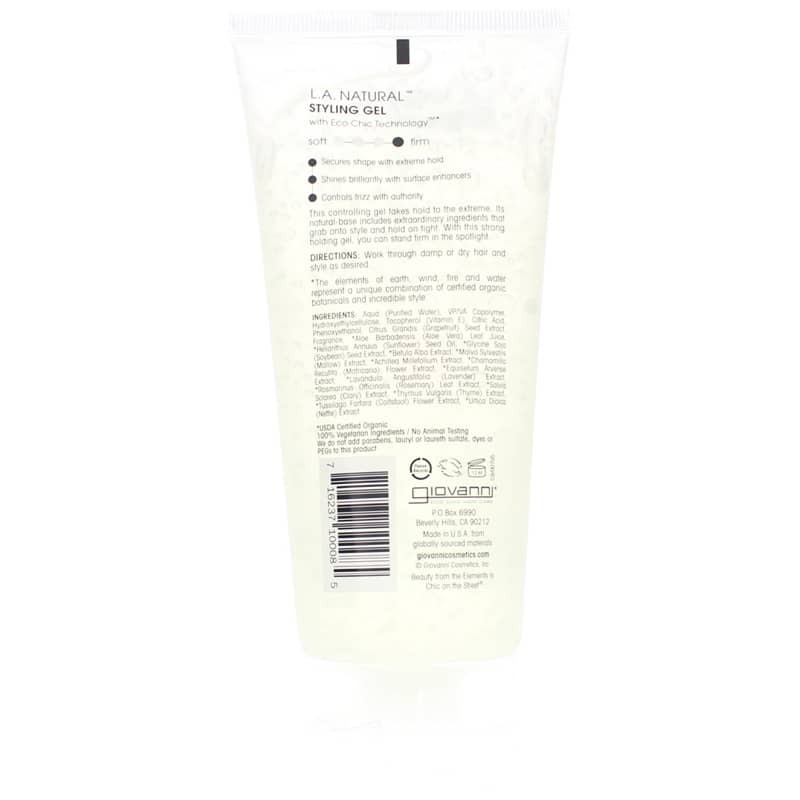 L.A. Natural Styling Gel contains a blend of organic oils, ripe-harvested from renewable plants at the peak of their freshness, cold pressed and refrigerated immediately to ensure maximum purity, infuses each individual strand of hair with vitamins, nutrients and protein for strength and vitality. Aqua (Purified Water), PVP/VA Copolymer, Hydroxyethylcellulose, Tocopherol (Vitamin E), Citric Acid, Phenoxyethanol, Citrus Grandis (Grapefruit) Seed Extract, Fragrance, *Aloe Barbadensis (Aloe Vera) Leaf Juice, *Helianthus Annuus (Sunflower) Seed Oil, *Glycine Soja (Soybean) Seed Extract, *Betula Alba Extract, *Malva Sylvestre (Mallow) Extract, *Achillea Millefolium Extract, *Chamomilla Recutita (Matricaria) Flower Extract, *Equisetum Arvense Extract, *Lavendula Angustifolia (Lavender) Extract, *Rosmarinus Officinalis (Rosemary) Leaf Extract, *Salvia Sclarea (Clary) Extract, *Thymus Vulgaris (Thyme) Extract, *Tussilago Farfara (Coltsfoot) Flower Extract, *Urtica Dioica (Nettle) Extract.